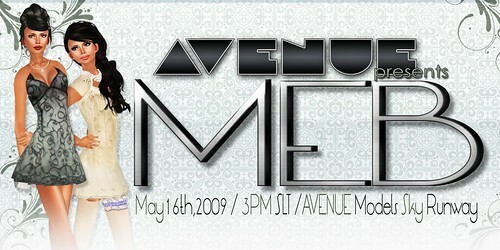 PR Contact: Jesika Contepomi, Vice President of Marketing, AVENUE Inc.
AVENUE Models welcomes all to the new AVENUE Sky Runway on Saturday, May 16, 2009 showcasing the cutting edge designs of MEB. AVENUE Models Florentine Rau, Jesika Contepomi, Kryptonia Paperdoll, Shenandoah Saintlouis, and Tralove Pinazzo will display fashions from trendy fabulous to Urban genius. This is the chance to bare witness to why MEB stakes its claim in the fashion industry and secures it with artistic, creative and exclusive designs. Fashion takes a step forward in a new direction as MEB showcases designs that open a door to endless possibilities. Creative in its design and unique in the various application of textures, MEB creates a love story in fashion design. Casual courts trendy urban and glamour romances dressy casual creating a loving fairytale that is timeless. Join AVENUE Models as they play out this love story before your very eyes. MEB, where fashion is “Real Style in Second Life”. MEB, owned and operated by MariaElena Barbosa, pulls it’s characteristic inspiration from casual to urban style reaching high levels on elegance in evening outfits. MEB creates clothes which challenges the well known excessive veils and other artifices present in many SL clothes, going towards the wearable sobriety of the classic and sport lines with surprising spots of graceful fantasy. 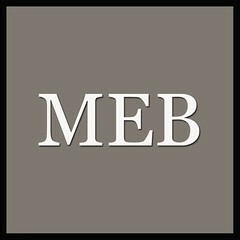 MEB’s catalogue consists of elements which empower the customer to express her refinement and originality. Pointing towards high quality textures and orignally vivid colors, MEB offers a casual, elegance in their jeans and leather jackets, coats and overcoats. Their elegant dresses are enriched with transparencies and laces combined with very original jackets remind one of the last century of fashion through its floral fantasies, bringing it into a modern context. For more information please contact MariaElena Barbosa. AVENUE Models is SL’s premier modeling agency with the most magnificent and professional setup for top supermodels. AVENUE Inc, is the umbrella company for AVENUE Models, AVENUE Studio, AVENUE Models Academy and AVENUE Magazine. AVENUE was founded by Rusch Raymaker, CEO, and by her side is a team of highly professional and qualified fashion, creative and marketing professionals striving to continuously take the world of fashion to another level. For more information please contact Jesika Contepomi, Vice President of Marketing for AVENUE Inc.